We’ve joined forces with local residents to call for stone imports to Stoke Hall Quarry in Grindleford to stop, and have objected to a retrospective planning application. The quarry is located in a sensitive area in the national park, and is accessed via a dangerous road junction on a blind summit. Current permission already exists which allows the quarry to extract and export stone from the site, but not to import stone from elsewhere and cut it up for redistribution. 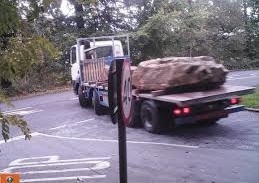 Stancliffe Stone, the company who own the quarry, installed new wire saws at the quarry in 2012 for cutting imported stone without planning permission, causing huge numbers of unauthorised lorry journeys. They are now seeking permission to retain the saws and continue importing stone. We agree with local residents’ concerns that the current permission should not be changed. Whilst the gritstone from Stoke Hall Quarry is a valuable asset and plays an important part in building stone markets, in the Peak District and further afield, there is no need for the site to become a regional processing centre, especially given the high level of protection that exists for national parks. “It’s a matter of balance, and the commercial preferences of Stancliffe Stone do not trump national and local policies to protect our finest landscapes”. The final decision will be made by the planning committee of the Peak District National Park in either March or April of this year.